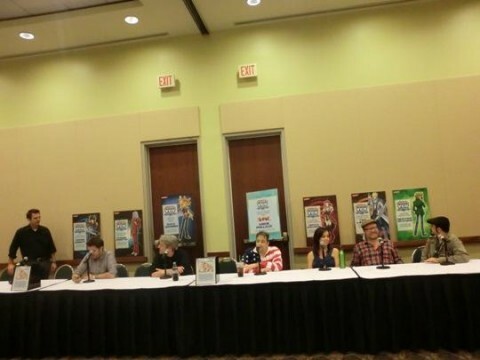 Greg Abbey and Dan Green revealed that they were friends for a long time and heard about auditions for the Yu-Gi-Oh! series. They auditioned and were cast for their roles. Once they got their foot in the door with 4Kids, they got the opportunity to do other stuff. Darren Dunsten said that he has been with 4Kids for 11 years and even does directing. Darren Dunsten directed Yu-Gi-Oh! : 3D Bonds Beyond Time. The voice actors were asked how they got into voice acting, and took turns responding. The voice actors were later asked which role they would want to play, apart from a role they’ve had, if they could choose any role. Wayne Grayson replied, “I’d like to do a lot more straight-up super heroes.” Ted Lewis joked that he would’ve loved to play Mai, but wasn’t right for the part. He then gave a slightly more serious answer, saying he would’ve liked to play Yugi because he’s famous. Dan Green said he thought it would’ve fun to be “the epic bad boy” that is Seto Kaiba. Darren Dunsten, the voice of Pegasus, said that he hasn’t had the opportunity to be a sidekick, and thinks that would be fun. One of the audience members asked Wayne Grayson why he never acknowledges that he’s Dartz. One Duelist asked Dan Green what his favorite Duel from the show was. “It was always fun to fight Kaiba,” he responded. “And Pegasus as well.” He also added that he really liked the final Duel of Yami versus Yugi. “I think when the series concluded and it was Yami versus Yugi, story-wise, that was a very interesting Duel.” Dan Green explained that “you can fall into the Trap of ‘this is me just yelling out another card,’” but really, there’s emotion. One Duelist asked Erica Schroeder what her favorite monster is, and she thought for a while before giving the obvious answer of Black Rose Dragon. One fan asked Erica Schroeder and Wayne Grayson what it was like “playing the two best characters ever created in Joey and Akiza,” and both of them said that it was awesome and a lot of fun. A Yu-Gi-Oh! fan asked the voice actors the toughest part about their roles. Ted Lewis explained that in some of Bakura’s Duels, there would be a lot of screaming and it can get tough after a while. He said that there were times that he’d feel light-headed after saying his lines. Greg Abbey noted that, if a voice actor isn’t careful, his or her character can unintentionally change. He said that it’s important to stay consistent. Erica Schroeder pointed out that a character can also change when the director changes and has a different image in mind for the character. Dan Green, who played both Yami Yugi and the younger Yugi, said that moving his voices to the extremes was the most difficult part of his role. He said that, initially, both Yugi and Yami Yugi’s voices were closer to his original voice, but Yugi’s voice gradually got higher, and Yami Yugi’s voice gradually got lower as the series progressed. Fans liked a more commanding Yami Yugi. One fan asked Dan Green which he liked more: the Egyptian Gods or Exodia. He said that he likes the Egyptian Gods, but he really likes saying “Exodia! Obliterate!” He then said it for the crowd! When Wayne Grayson was asked about the Yugi versus Joey Duel from the original series, he said that he had become friends with Yugi (Dan Green) in real life, so it fed the angst of Dueling against a friend. One fan asked Dan Green whether he thinks it was unfair that Yami Yugi got to use all 3 Egyptian Gods against Yugi in their last Duel. Dan Green joked, “It’s hard to say – I like both those guys.” He pointed out, however, that one of the most important questions to ask when making a decision about the show, is “how does this serve the story?”. He said that he thinks giving all of the Egyptian God Cards to Yami Yugi helped the story. One Yu-Gi-Oh! fan requested that Dan Green say the Ra chant. Dan Green asked him to write down the chant since he didn’t know it off the top of his head. After the audience member got it down for him, Dan Green happily obliged. At another point, a few of the voice actors said that voice acting is hard to do if you’re not in a major city like New York or Los Angeles. Greg Abbey noted that you can’t “go half into it” and that “voice acting should be taken as seriously as any type of acting.” He said that it’s important to study to be an actor. One person asked Dan Green if it was tough to transition from one Duel to the next, and if it was difficult to Duel against himself in the last Duel of the first series. Someone asked the voice actors how it felt to be working together again on the Yu-Gi-Oh! 3D movie. “It was like visiting an old friend,” Dan Green said. He hadn’t been in character for a long time, so he was excited to get the chance to be Yugi again. As a final request, someone asked Ted Lewis to say “I Summon Red Dragon Archfiend!” as Jack Atlas. He happily did it, and then was asked to say it in a French accent. Ted Lewis did that too. 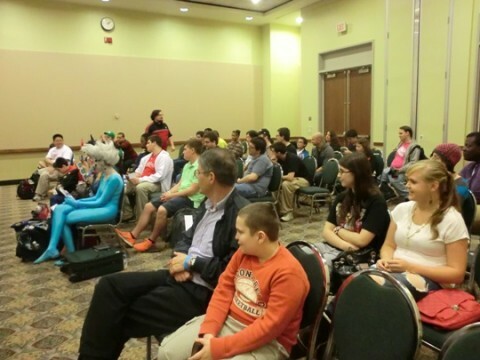 Everyone who attended Saturday’s voice actor panel discussion had a lot of fun. It’s tough to really capture the excitement in the room and the laughs of the audience members, but there will be another voice actor panel discussion today at 2:30 PM. If you’re a Yu-Gi-Oh! fan and you’re able to attend, don’t miss it!